Birthdays, birthdays, birthdays….there always seems to be a birthday in my family. 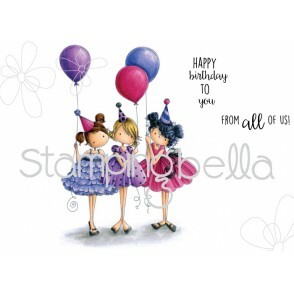 Tiny Town Birthday Party from Stamping Bella is the image I used in today’s card. 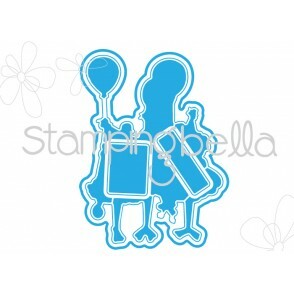 I just love these little images! 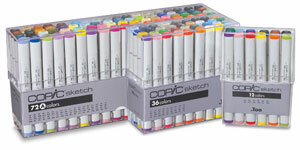 I colored them with my Copic markers and then used the matching dies to cut them out. I used the die to cut them out of fun foam and put the colored image on the fun foam before adding it to my card. Simon Says Stamps has some balloon dies, and I thought they would make a perfect background for the girls. I added some sequins around the card from Pretty Pink Posh. The sentiment is from Simons Says Stamp, Birthday Flowers. I heat embossed it using Ranger’s Plantinum Embossing Powder. My paper is from Pebbles Basic pad.